I picked up this set in my recent Mecca haul as I'd heard really good things about these eyeliners and I thought it was a good opportunity to try out a few different colours without purchasing them all fullsize. I don't use coloured eyeliners a lot so it seems a bit silly to fork out $33 for each individual shade when this kit for five mini sizes was only $48. Unfortunately this review is not a positive one and I have a few different reasons why. I'll review each shade individually. This is really pigmented and really black. Unfortunately it just doesn't stick to the eyes. It is an extremely soft eyeliner meaning it's hard to get a precise line and if you attempt to blend it out with a blending brush it just blends right off your eye. "a smoky black with blue and green sparkle"
"deep metallic purple with shimmer"
I'm still searching for a really good purple eyeliner that actually shows a true colour. Similar to the green this just doesn't show up on the eyes and turns into more of a muddy brown when blended. "bright metallic blue with shimmer"
This is the best of a bad lot. This is an actual blue eyeliner and shows up fairly well but as with all the eyeliners in this set they are just too soft and when blended they just come straight off. "deep metallic brown with burgundy shimmer"
Hard to see the burgundy shimmer they're referring to here - this is your basic brown eyeliner and is probably the only one that shows it's true colours on the eyes. Overall I would say don't waste your money on this set. I certainly won't be wearing these eyeliners at all which is a total waste of the $48 I paid for it. I just hope this review stops someone else wasting their money. I'd love to hear from anyone who's tried the full size of these liners to see if its a common theme with all their liners or if they've just cheaped out with their mini travel set. Great post, truly inspiring, I love it. Thank you for sharing and for the tips. Disappointing considering the cost! 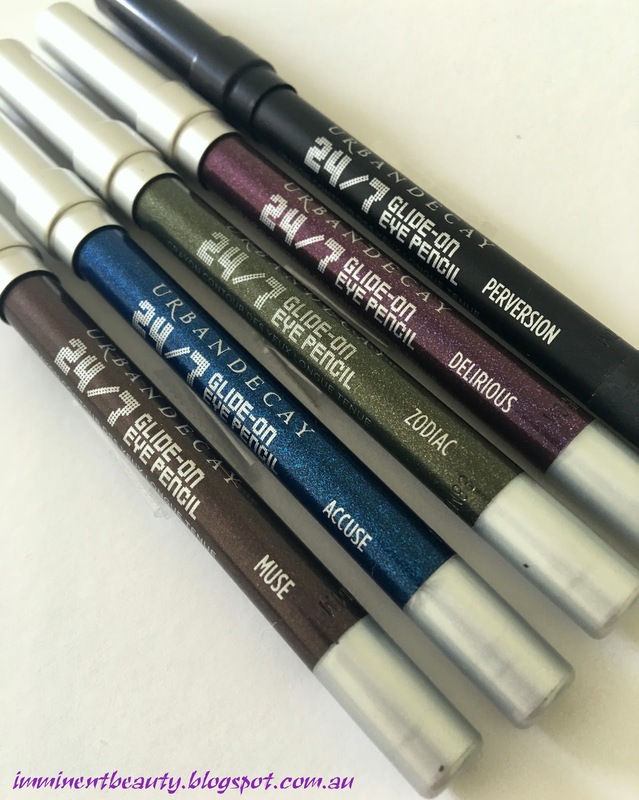 I've been eyeing these eyeliners off (haha) so glad I saw your review before I purchased! Oh, what a disappointing product, I got one in black market from ebay, and it is working very well.